ATC Eurospun Tee with full front printed logo. Available in Black. Available Youth SM - XL or Adult SM - XXL. Add film right sleeve number for $4.00. 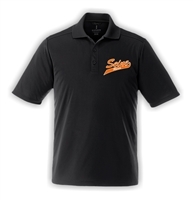 Trimark Dade Golf Shirt with left front embroidered logo. Available in Black. Available Adult SM - XXL. Add embroidered right sleeve number for $7.00. Russell Pullover Hoodie with full front printed logo. Available in Oxford Grey or Black. Available Youth SM - XL or Adult SM - XXL. Add film right sleeve number for $4.00. Add film back bottom name for $5.00. Stormtech Warrior Track Jacket with left front embroidered logo. Available in Black/Orange/White or Black/Black/White. Available Youth SM - XL or Adult SM - XXL. Add embroidered right sleeve number for $7.00. Add embroidered back bottom name for $15.00.